okay…I didn’t make it in under the wire, but I do have it. 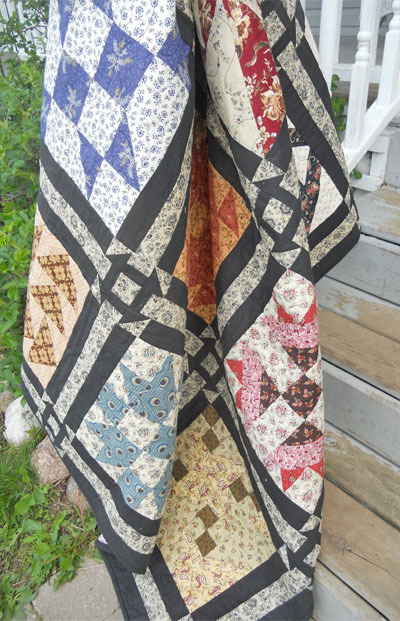 today (I mean, yesterday) we packed up to head on down to Faribault for their Quilt Show this weekend. 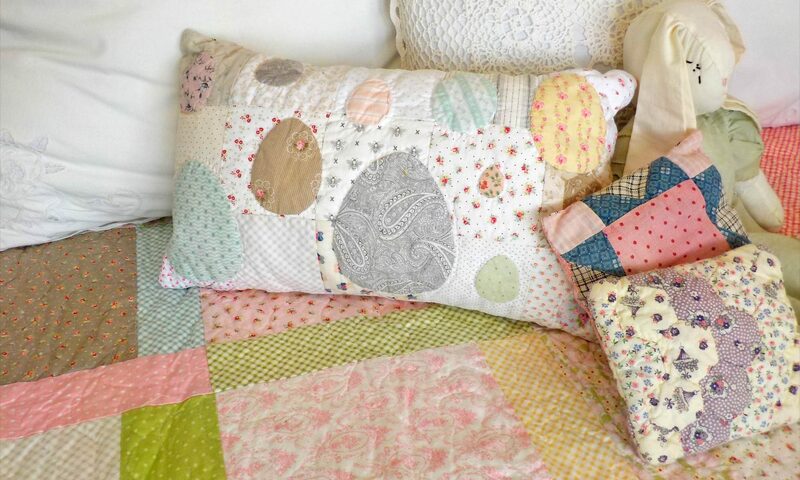 Olivia is quilted and almost bound…we have some pictures! 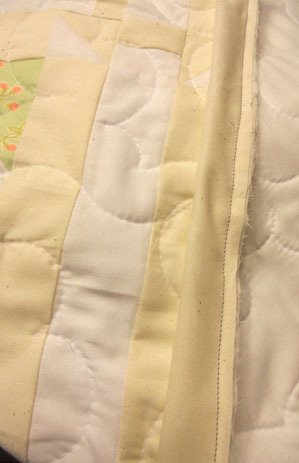 we quilted her with white and a medium meander. we opted for cream binding. 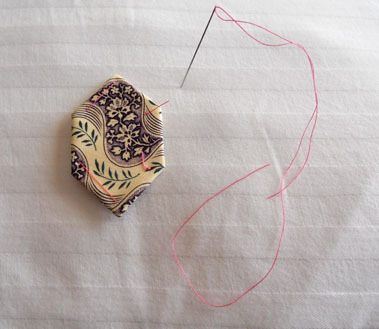 we will wrap it around and stitch it down by machine, but some of you may opt to stitch it down by hand. we have several shows and other events coming up this autumn season so be sure to check out our “Events” page to see what going on. i’ll be posting to instagram and facebook this weekend…so be sure to follow us so you can see some of our new projects that I haven’t had time to post yet. have a good weekend and happy stitching! Sorry for the delay…it has been a busy day. Layout the blocks, sashing, and cornerstones as follows and piece together. 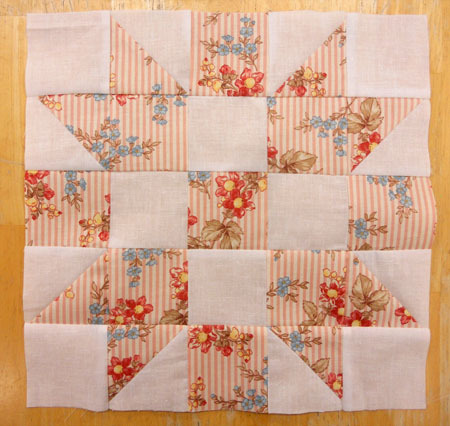 Quilting and binding tomorrow. 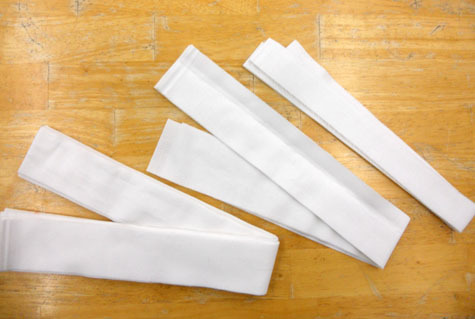 hope you had a chance to finish up the sashing strips. today we are going to work on the cornerstones. these little darlings are just so sweet! Cut the 2 3/8 inch strips into 2 3/8 inch squares. 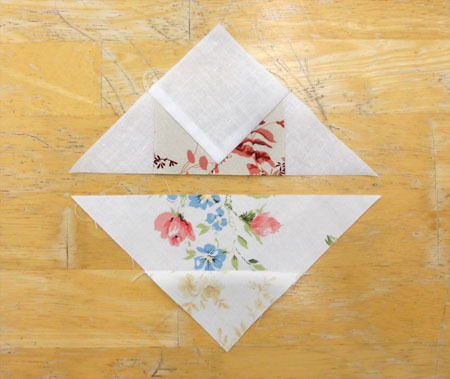 Pair up the 2 3/8 inch squares placing a solid face to face with a floral. 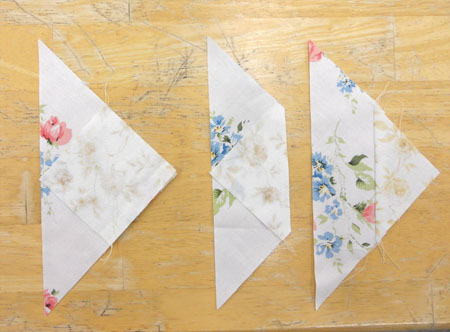 Draw a line diagonally and sew a 1/4 inch down each side. Cut on drawn line. Press towards darker fabric. Repeat for 80. 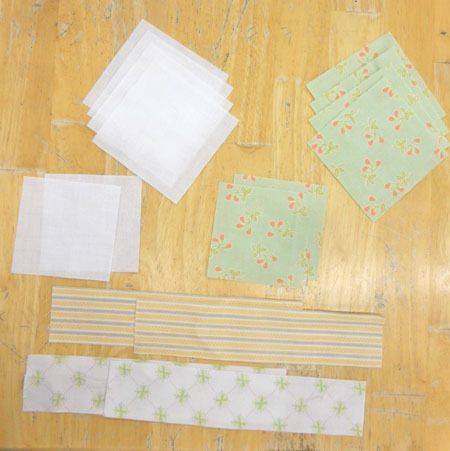 Piece together the 1 1/4 inch strips…1 floral and 1 solid. 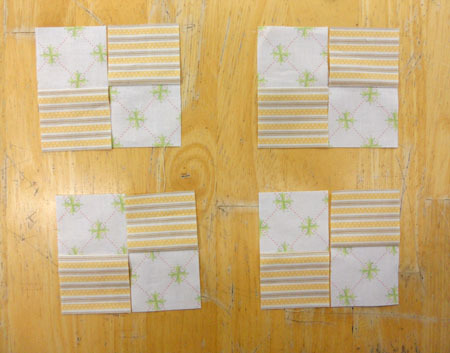 Then crosscut into 2 inch combination squares for a total of 80. 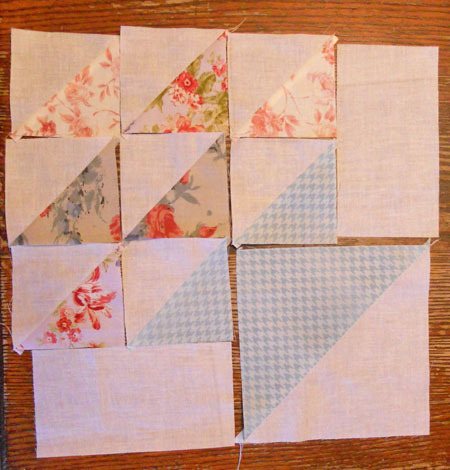 Layout as follows using the 2 inch squares cut last week, 4 half square triangles combinations, and 4 square combinations. okay…now that you have the cornerstones done…get ready! 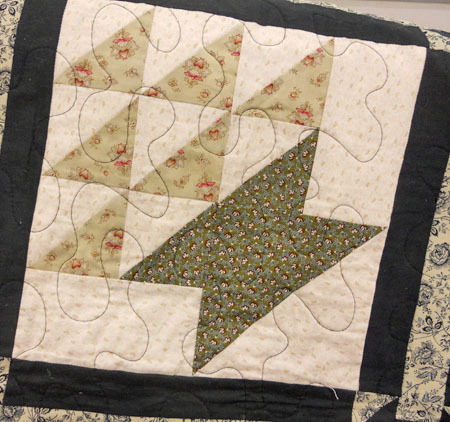 we’ll be back next week with some piecing instructions for the sashing, quilting, and binding. 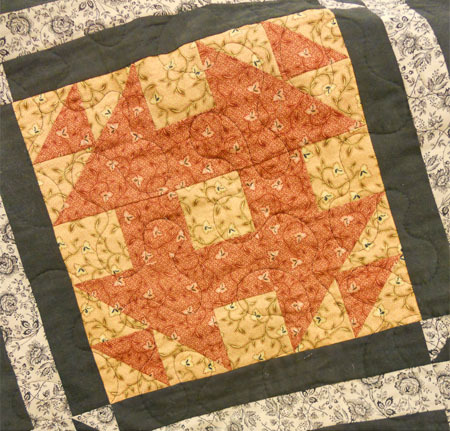 then be sure to join us on September 30 for our Christmas Morning Quilt Along. More information coming along with kits and pictures. Good MOrning gentlefolks…mom and I hope you had a wonderful (and safe!) labor day weekend! it was nice to have a couple days off…in a row. I worked on a few things –not this post unfortunately…so I am throwing it together this morning at 11am. 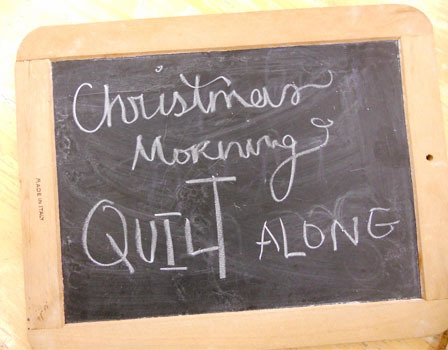 lastly…be sure to join us September 30th for our Christmas Morning Quilt Along. 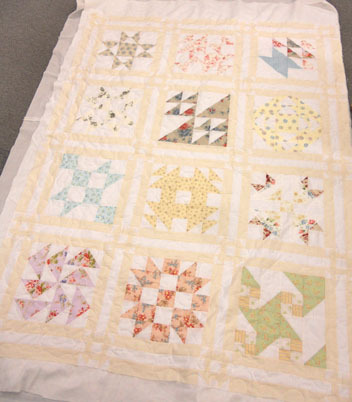 mom finished her up…hopefully I can get her quilted…then get kits out and ready to go! Now…on to the good stuff! I decided to split the sashing & cornerstones into 2 posts. this week we will cut for both the sashing and the cornerstones but only work on the sashing…next week we’ll finish up with the cornerstones. 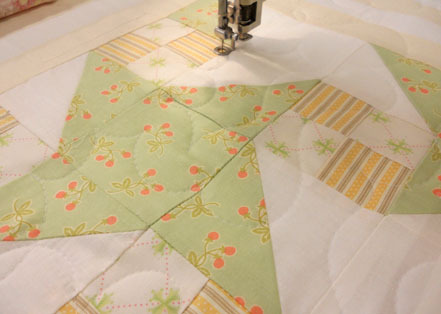 then lastly, Tuesday, September 16 we’ll have a short quilting/binding post. 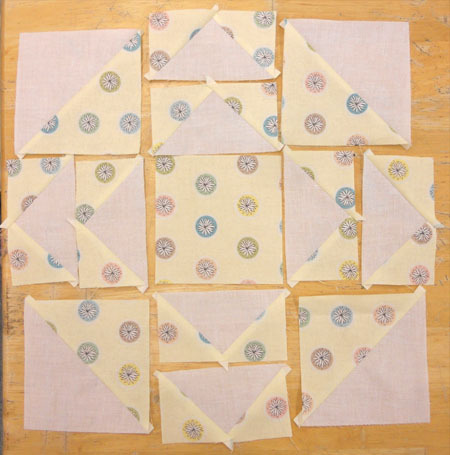 First before cutting any sashing…trim all blocks to the same size…if possible. blocks should measure 12 1/2 inches…however, ours have measured closer to 12 1/4. 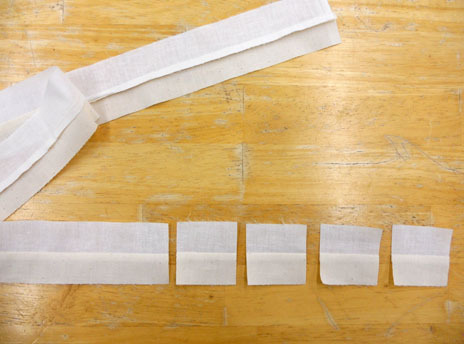 Cut 1 solid 2 inch strip in half and piece to each side of 1 floral strip. 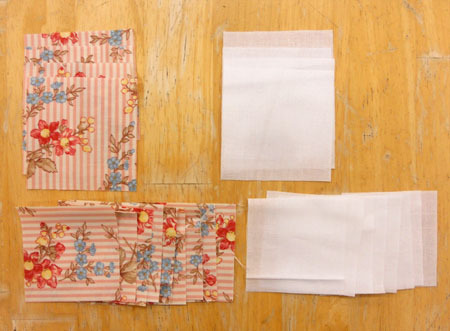 With remaining 2 inch strips sew a solid strip to each side of floral strips. 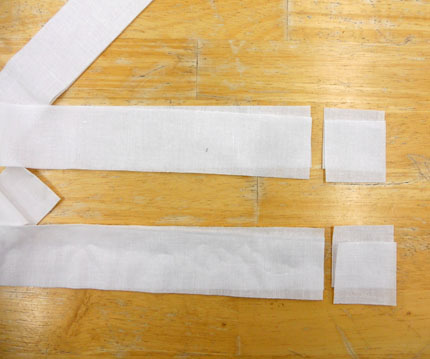 Now cross-cut sashing strips to length of blocks. Ours were cut at 12 1/4 inches. Cut a total of 31 combinations. be sure to stop back next week for the cornerstones and final journal entries. Good Morning! 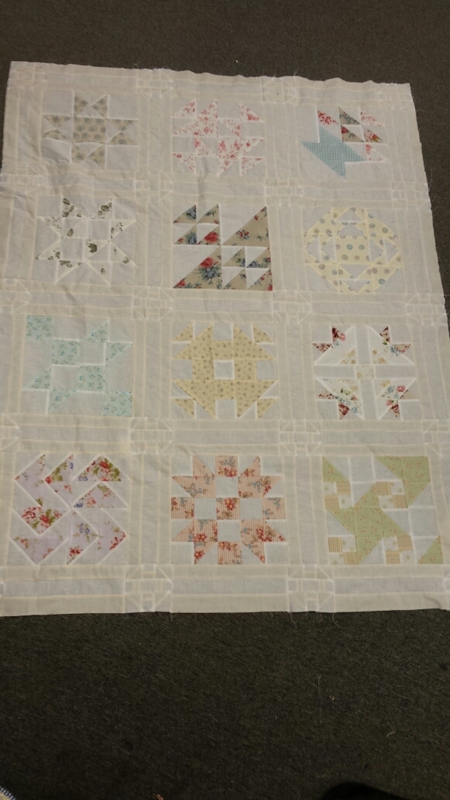 Today is the 12th and final block of Olivia’s Sampler. I hope you have been following along with us as we travel back to Sweetwater with Olivia and her family and friends. 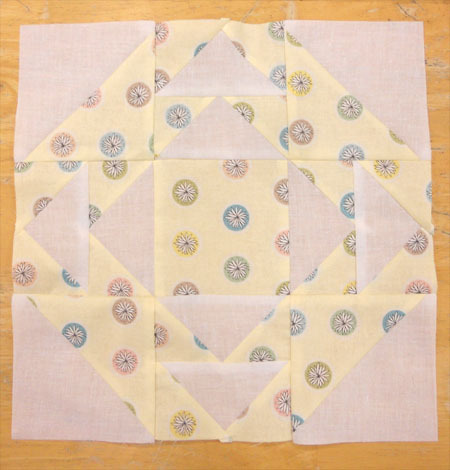 Today is the final Tuesday of our Olivia’s Sampler summer block of the week! We first did Olivia’s Sampler ten years ago…it started in September of 2004. We just had our 10 year anniversary on June 4th, and i thought that doing a little summer throwback would be tons of fun! So, alas, here we are. Before we move on to pictures…i have a couple links for you today. 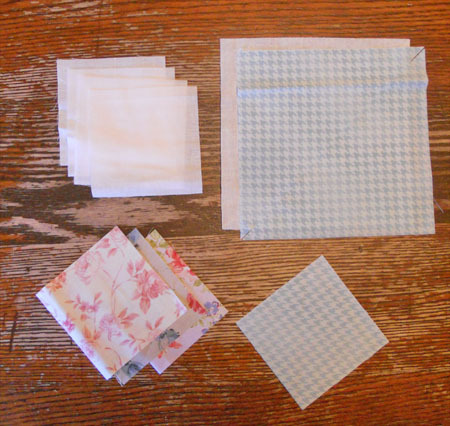 If you are interested in a kit…here is the link… Olivia’s Sampler Floral Kit. 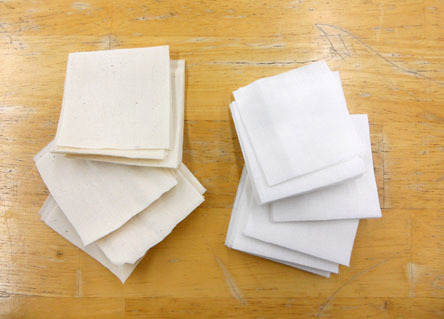 Our kit is for a fat 8th bundle of florals and bleached muslin (which will be used in place of the background in every block and the black on tan floral in the sashing, corner stones, and border), and unbleached muslin (which will be used in place of the solid black in the sashing, corner stones, border and binding). 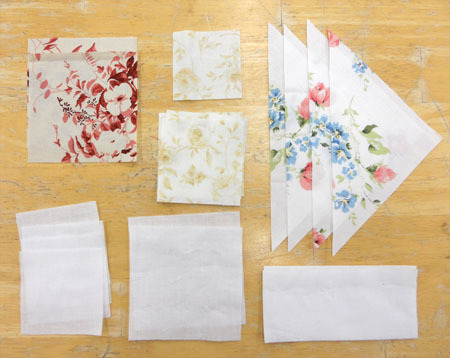 Our floral bundle will be the same bundle in the kit. 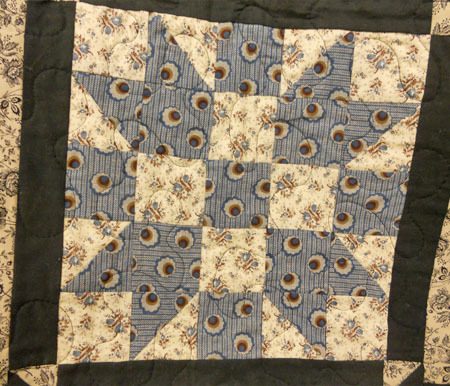 Interested in a civil war kit…drop me a line. 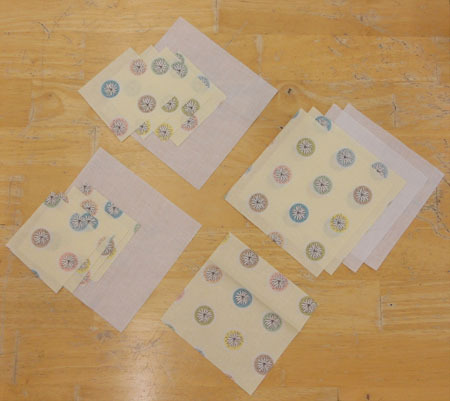 The prints we used in 2004 are no longer available, but i can do my best to get you a kit of fabrics as similar as possible. If you are interested in reading the intro to Steamer Trunk Treasure…here is link…The Life & Times of Olivia J Cowden. 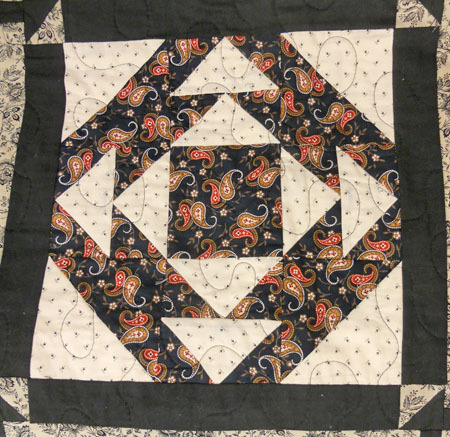 Place the 3 7/8 inch dark and light squares face to face. 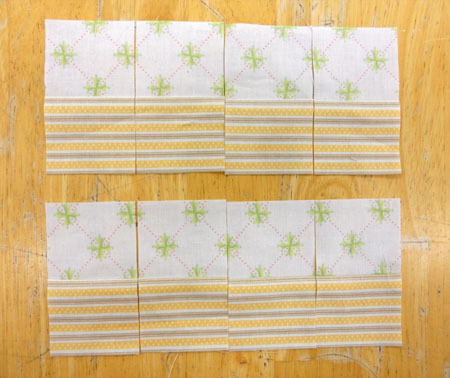 Draw a line diagonally and sew a 1/4 inch seam down each side. Cut along drawn line. Press and trim. Repeat. 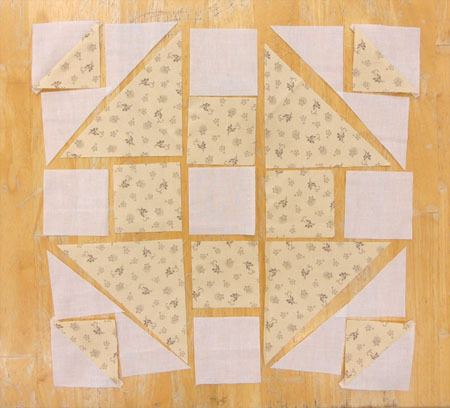 Piece together Gracie Porter block. 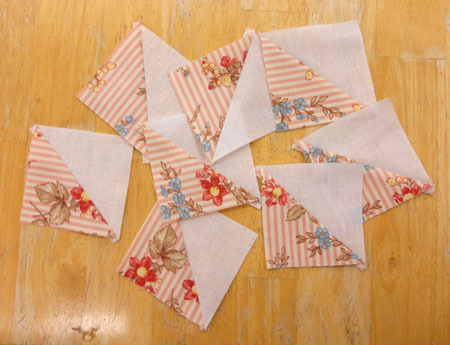 trim blocks to 12 1/2 inches square this includes a 1/4 inch seam allowance for joining them to the sashing. Download block instructions and journal entry below. Good Morning! Today is block 11 of Olivia’s Sampler. 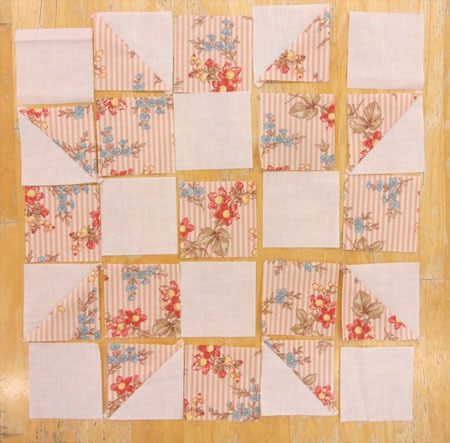 Today is the 11th Tuesday of our Olivia’s Sampler summer block of the week! We first did Olivia’s Sampler ten years ago…it started in September of 2004. We just had our 10 year anniversary on June 4th, and i thought that doing a little summer throwback would be tons of fun! So, alas, here we are. 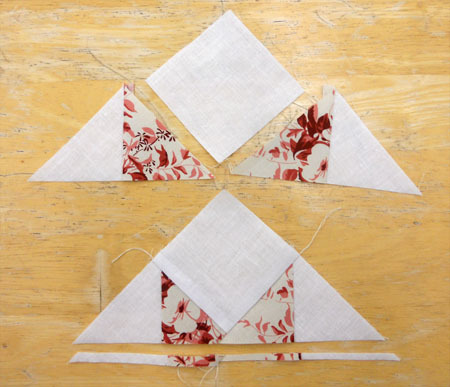 Place 1–3 inch square of dark 3 on corner of each 5 7/8 inch triangle. 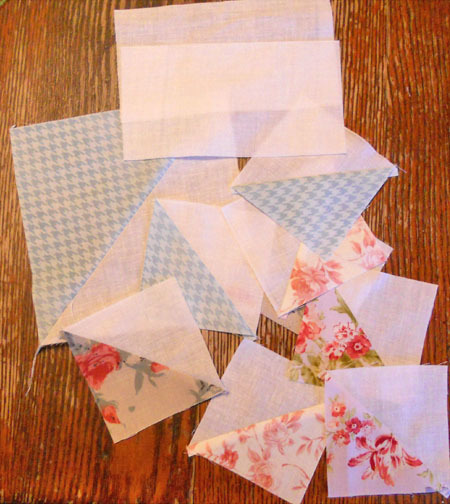 Sew diagonally then trim. Place the 4 inch squares of light and dark 1 face to face. 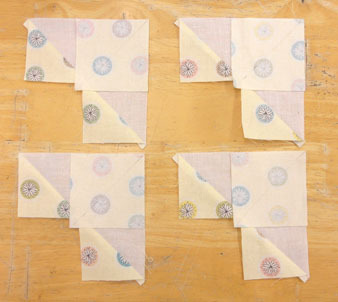 Draw a line diagonally and sew a 1/4 inch seam down each side. Cut on solid line. Repeat for 4. 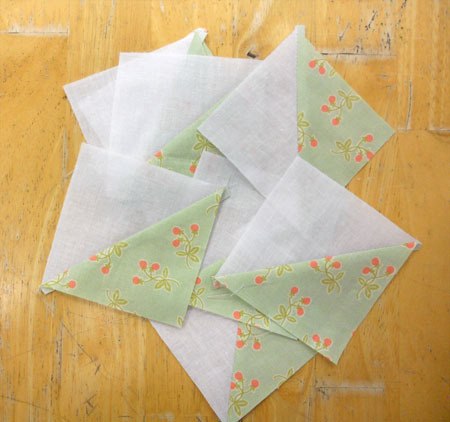 Then cut each diagonally for a total of 8. 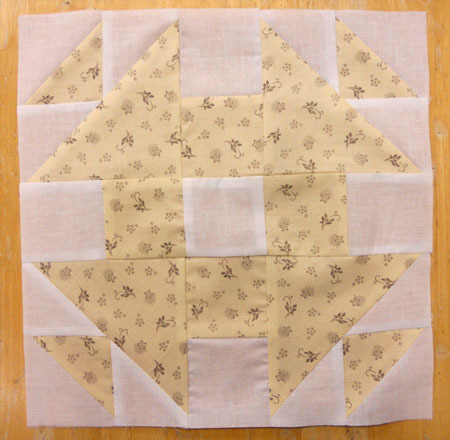 Piece together using combos and 4–3 inch squares light. Trim to a 1/4 inch seam along bottom. Piece together 4 as follows. Join us next Tuesday as we finish our journey with Gracie Porter. Good Morning! Today is block 10 of Olivia’s Sampler. If you are joining us for the first time today…this is what’s going on. 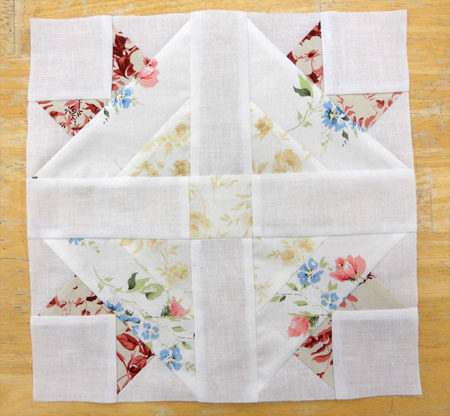 Today is the seventh Tuesday of our Olivia’s Sampler summer block of the week! We first did Olivia’s Sampler ten years ago…it started in September of 2004. We just had our 10 year anniversary on June 4th, and i thought that doing a little summer throwback would be tons of fun! So, alas, here we are. 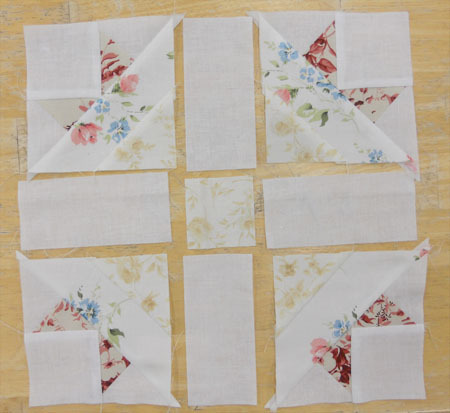 Lay 1–5 1/4 inch light square face up and place 2–2 7/8 inch squares on opposite corners. Draw a line diagonally from corner to corner. 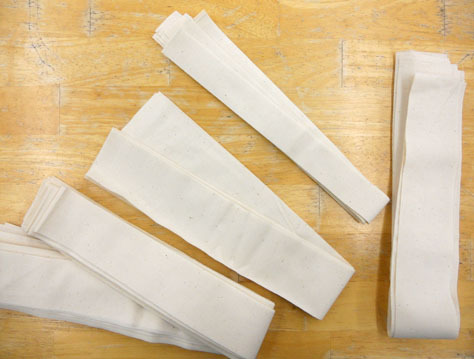 Sew a 1/4 inch seam down each side. Cut along drawn line. Press. 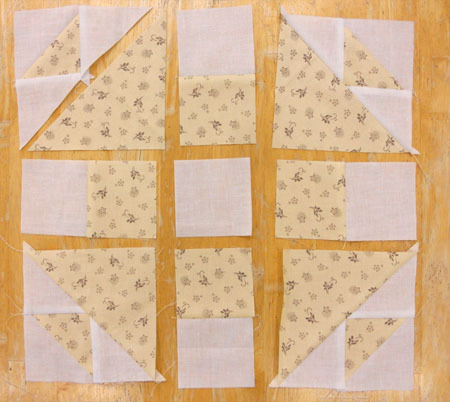 Place a 2 7/8 inch square on remaining corner. 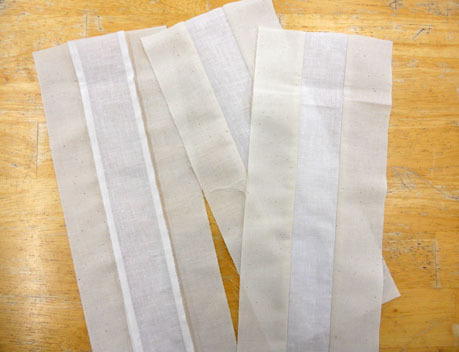 Draw a line diagonally and sew a 1/4 inch seam down each side. Cut along solid line. Press. Place the 4 7/8 inch dark and light squares face to face. 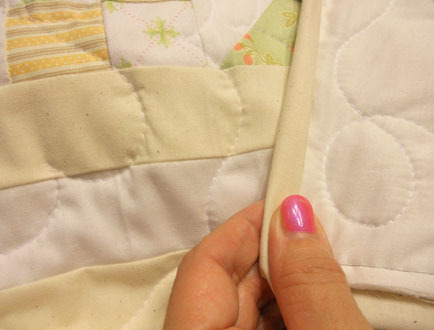 Draw a line diagonally and sew a 1/4 inch seam down each side. Cut along drawn line. Press and trim. 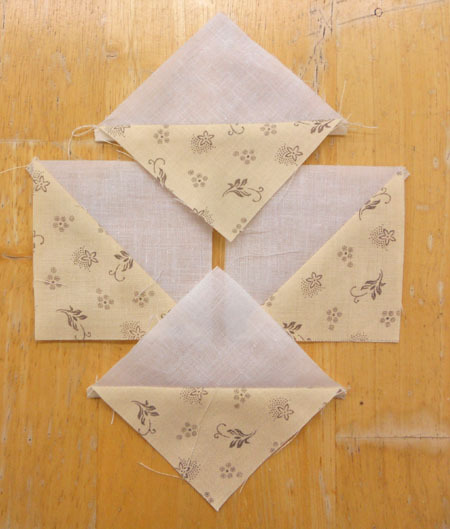 Repeat for 4 half square triangles. Piece together Katie Parker block. 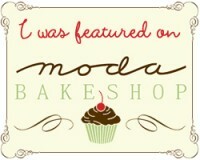 Join us next Tuesday as we meet up with Mabel Avery. Good Morning! Today is block 9 of Olivia’s Sampler. Place the 6 7/8 inch dark and light squares face to face. 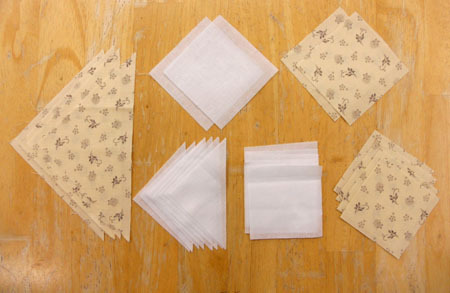 Draw a line diagonally and sew a 1/4 inch seam down each side. Cut along drawn line. Press and trim. 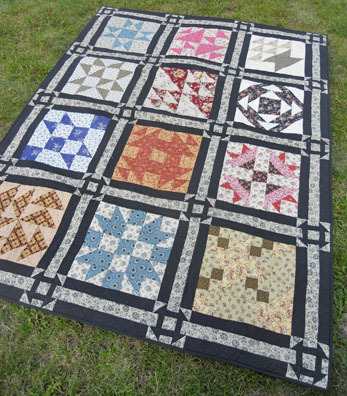 Repeat with the light and dark 3 7/8 inch squares and the 3 7/8 inch squares light and various medium prints. Join us next Tuesday as we meet up with Katie Parker, Olivia’s Aunt. Good Morning! Today is block 8 of Olivia’s Sampler. If you are joining us for the first time today…this is what’s going on. 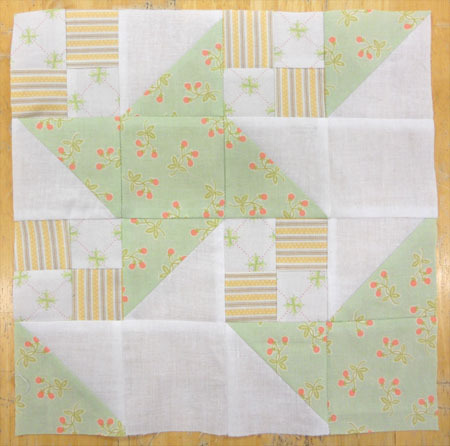 Today is the eighth Tuesday of our Olivia’s Sampler summer block of the week! We first did Olivia’s Sampler ten years ago…it started in September of 2004. We just had our 10 year anniversary on June 4th, and i thought that doing a little summer throwback would be tons of fun! So, alas, here we are. 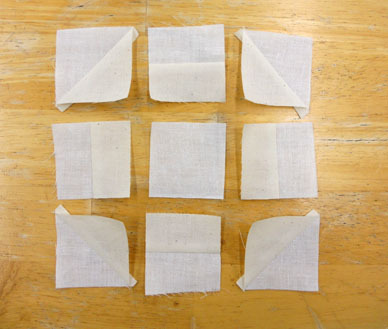 4–3 1/4 inch squares light Place the 3 1/4 inch dark and light squares face to face. 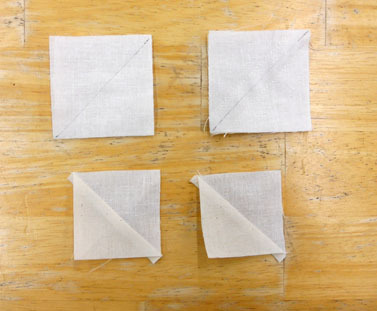 Draw a line diagonally and sew a 1/4 inch seam down each side. Cut along drawn line. Press and trim. Piece together Dr. William Tate block. I did not realize that i never gave a final size of the block. 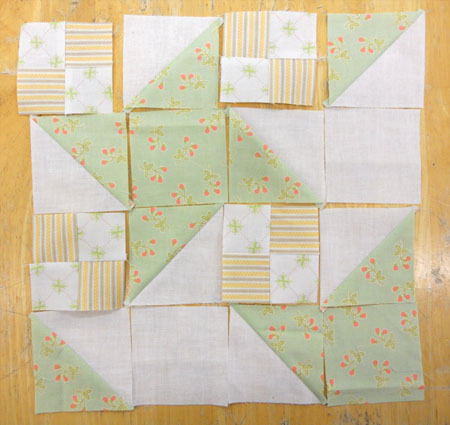 the blocks should measure 12 1/2 inches square this includes a 1/4 inch seam allowance for joining them to the sashing. Join us next Tuesday as we meet up with Mae Fleur. Good Morning! Today is block 7 of Olivia’s Sampler. 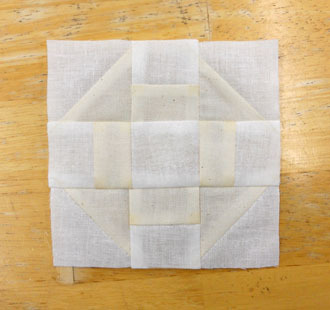 Place the3 3/8 inch dark and light squares face to face. 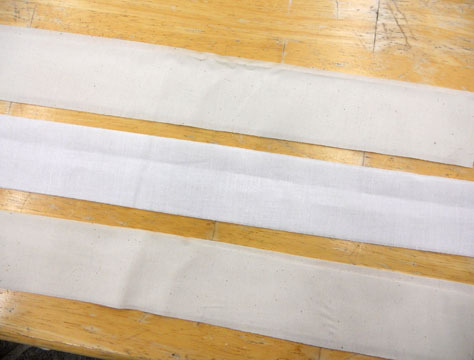 Draw a line diagonally and sew a 1/4 inch seam down each side. Cut along drawn line. Press and trim. Piece together block corners and squares as follows. Piece together Sadie & Theoline Hoyt block. Join us next Tuesday as we meet up with Dr. William Tate.